The first concrete has been poured for the CRL tunnel box in Albert Street. Work started on December 21st 2015. It's taken the workers approximately 501,000 hours to get to this point. So far, 30,000 cubic metres of soil and rock have been removed and filled up a double trailer-truck 1,866 times. It’s also required about 8km of utility piping to be moved or suspended above the trench, and the main stormwater line two metres in diameter to be broken out and re-bored approximately ten metres sideways to the east. This is the reason a new 516 metre stormwater pipe was installed from Wellesley to Swanson Streets. Notice something different about the corner of Victoria and Albert Streets outside the President Hotel? The shaft has gone. If you're wondering what's going on the other (bungy) side, the footpath is being widened. That work will probably go until Christmas. Inside the CPO, contractors Downer Soletanche Bachy have now constructed 43 Diaphragm Walls (known as Dwalls). These walls are excavated by the huge red rig “Sandrine” down to between 16m to 20m deep, they are then filled with concrete and run either side of where the new train tunnels are going to be constructed. 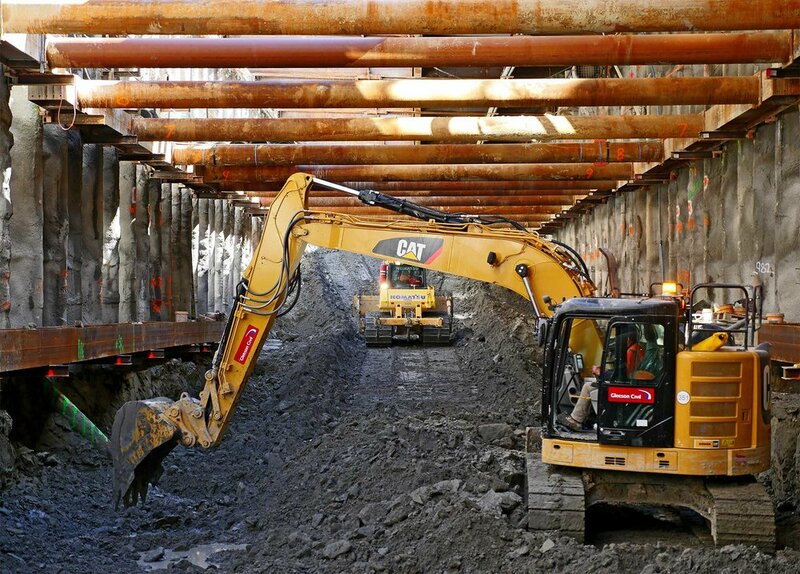 The Dwall’s main functions during CRL construction are to ensure ground water and soil doesn’t get into the deep open cut tunnel excavation and also to hold the entire weight of the CPO building so the excavations occur safely. This weight transfer from the CPO’s existing foundations on to the Dwalls is done through a process called ‘underpinning’. Underpinning is a system where a mixture of beams (some steel, some concrete) are used to transfer the weight of the CPO building off its existing foundations and onto the Dwalls so excavation works to build the new train tunnels can be done without impacting the structure of the historical building. Both inside the CPO and on Lower Queen St preparation works for the underpinning are currently underway. (The Dwalls are the 15 to 20-metre-deep wall panels that will form the structural support for the CRL tunnels inside the building). Inside the CPO the existing columns are being stripped and prepared for the installation of large ‘clamps’. The clamps will attach one end of the steel beam to the column while the other end of the beam is connected to the top of the Dwall. Once the installation is complete, the Dwalls will essentially be holding up the entire weight of the CPO. 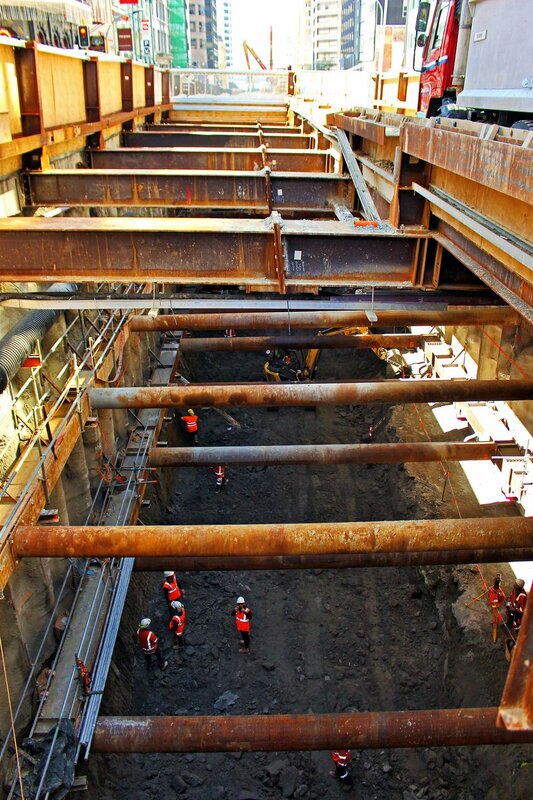 City Rail Link’s Albert Street trench has reached its full 18-metre depth near Wyndham St.
CRL contractor Connectus is now removing the 100-year-old stormwater pipe at the base of the trench before it can start building the CRL tunnel box at the southern end of the trench. The redundant stormwater pipe will be unearthed at shallower depths as the excavation moves north. At the Customs Street intersection, the pipe is at a depth of only eight metres. The old pipe and a pumping chamber must be removed, as they are in the way of the future CRL rail tunnels. 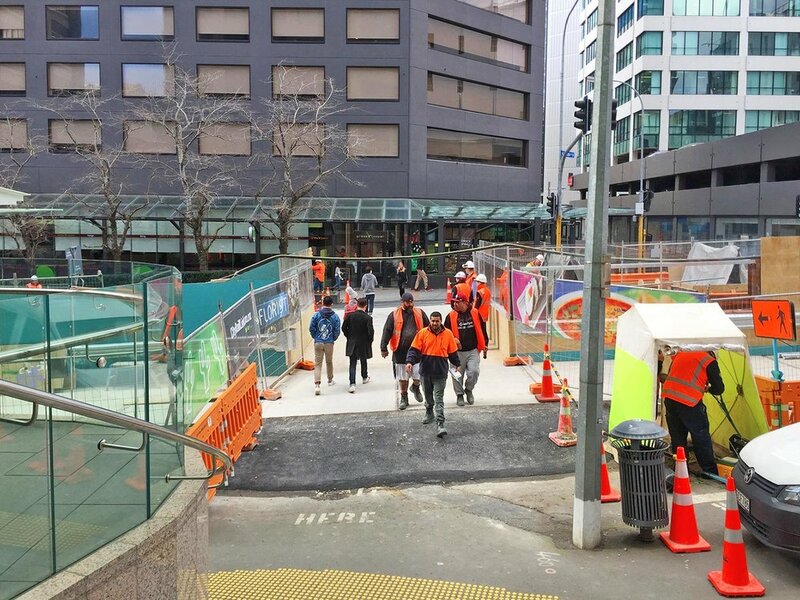 Contractor Connectus Joint Venture has now dug down to 17 metres between Kingston and Swanson Streets, leaving only one more metre to excavate before reaching the depth of the future CRL tunnels. The building of the tunnel box will then start in this section. The current depth of the rest of the trench varies between 3.5 to six metres. 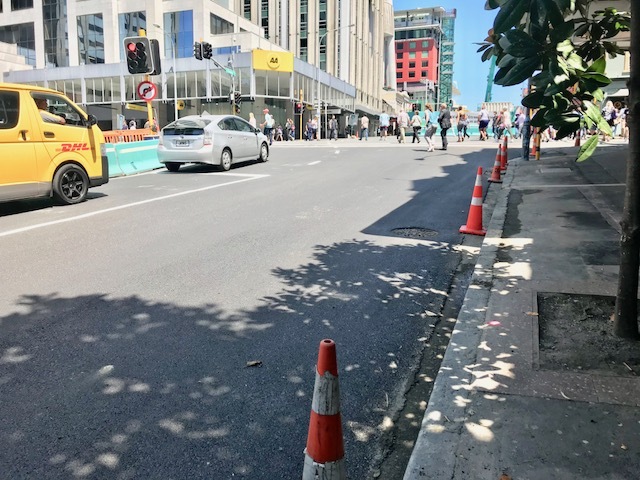 Contractor Connectus Joint Venture has now dug down to 12 metres between Kingston and Swanson Streets. 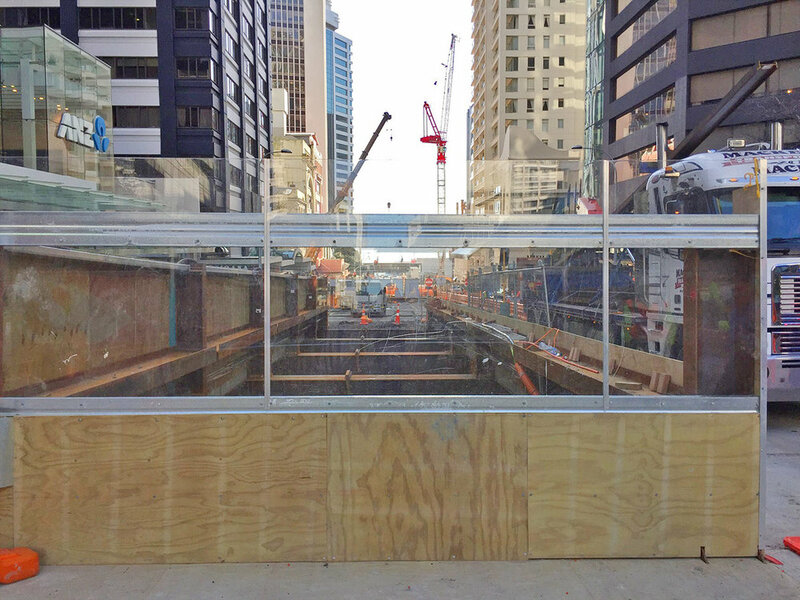 The Albert Street trench being built will eventually house the CRL tunnel box. At 18 metres deep, they will reach the bottom of the future tunnels in this section and will then start building the tunnel boxes. 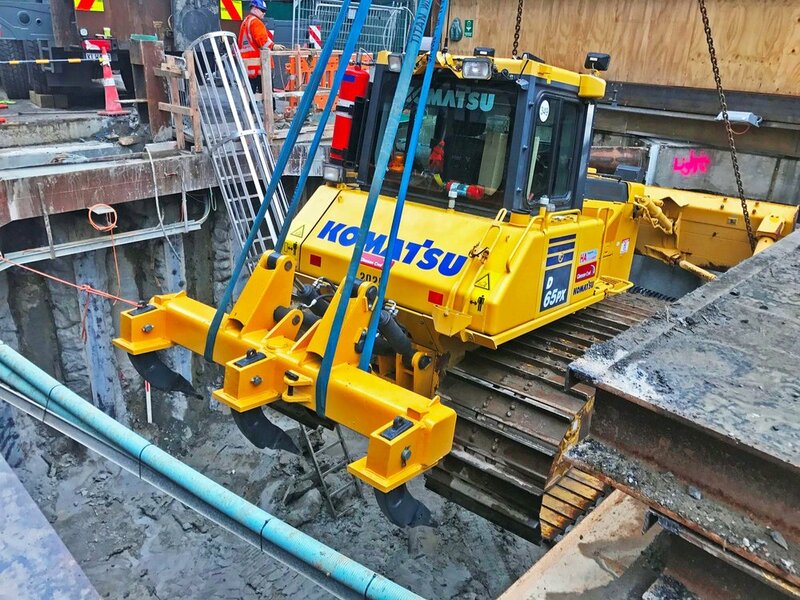 City Rail Link contractor Connectus Joint Venture has passed the halfway mark at the southern end of the Albert Street trench that will eventually house the CRL tunnel box. Excavators working both inside and outside of the trench have now dug 10 out of the total 18 metres at the Wyndham Street end of Albert Street, removing about 300 cubic metres of spoil each day. You can watch the underground excavation from two viewing platforms that span the Albert Street trench at Swanson and Wyndham Streets. Work continues inside Britomart’s Chief Post Office (CPO) building and on Lower Queen Street to prepare for the underground construction of the CRL tunnels. Inside the CPO, the CRL’s hydrofraise piling machine is constructing the 15 to 20-metre-deep diaphragm walls that will serve three important purposes: to provide ground support and prevent groundwater infiltration during excavation and structural support for the CPO building and CRL tunnels. To date, 24 out of 64 ‘D-walls’ have been completed inside the CPO, totalling 71m in length and using 1,070m3 of concrete. At platform level in Britomart Station, a section of platform has been removed on the northern side (and a new platform edge reconstructed) to allow the northern CRL tunnel to connect to the end of Platform 1. Temporary facilities are also being constructed here and these will be removed prior to the CRL becoming operational. Outside the CPO on Lower Queen Street, contractors Downer Soletanche Bachy have begun the careful removal of the heritage stairs. This work will continue into November. The bulk excavation continues between Wyndham and Swanson Streets. Between Swanson and Wolfe streets the top 1.5 metres of the excavation is completed. The Connectus team is working on the reinstatement of the road before re-opening the left turn into Wolfe Street in early October. On the eastern side between Mills Lane and Customs Street, the team has started removing the top 1.5 metres and placing struts and concrete panels. Both sides will be completed early November. Connectus has poured the last reinforced concrete deck slab for the traffic bridge at Customs St junction. This bridge will keep Auckland moving and protect Auckland’s utility services, while the Connectus team carries on with the construction of the CRL’s twin tunnels. This last section of the traffic bridge is planned to be completed early October. The intersection of Customs and Albert streets will be then reinstated to the public. Before the reinstatement of the road, the team will construct additional timber framework for the flowable fill (low-density concrete) around the services. The last step will be backfilling the section with aggregate and several layers of asphalt. The Connectus team with CRS LTD (Crane & Rigging Services) has lifted 12m long steel supports (struts and walers) into the Albert Street trench. The steel supports are going to be installed horizontally across the trench at 5 metres deep. There will continue along the trench. When completed, there will be about 68 steel struts supported by 300 metres of walers along the trench on each level. The trench will have three levels of supports, the top level is already completed. The steels support the walls of the trench while we continue to excavate deeper. This is a really complex lift due to the existing top level supports. Also the work site is really narrow and traffic still flows on both side of the road. The team needed to work really close together with Connectus Project Engineer Lance Vazey in charge of this job, our contractor the CRS company and our traffic management team, so public and site workers are kept safe. The 90-tonne compact rig Sandrine which was working in Lower Queen Street has been moved into the CPO building. 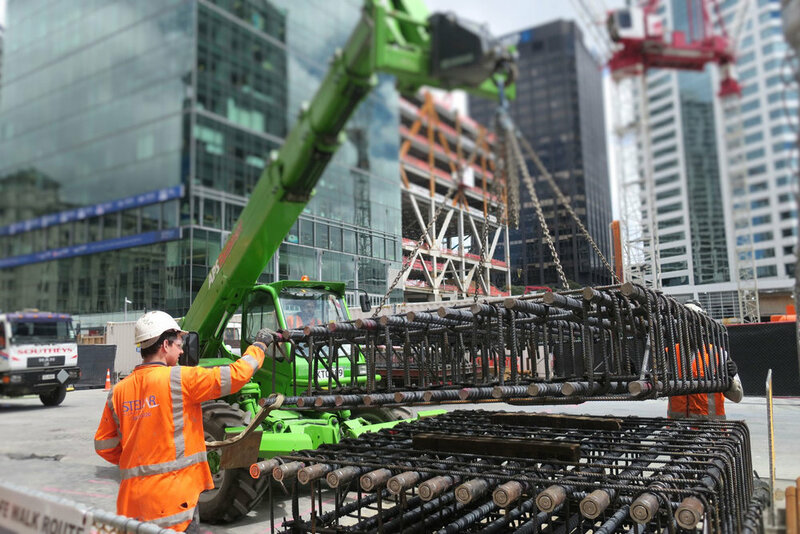 The machine is needed to dig the 15 to 20-metre-deep wall panels that will form the structural support for the CRL tunnels inside the building. 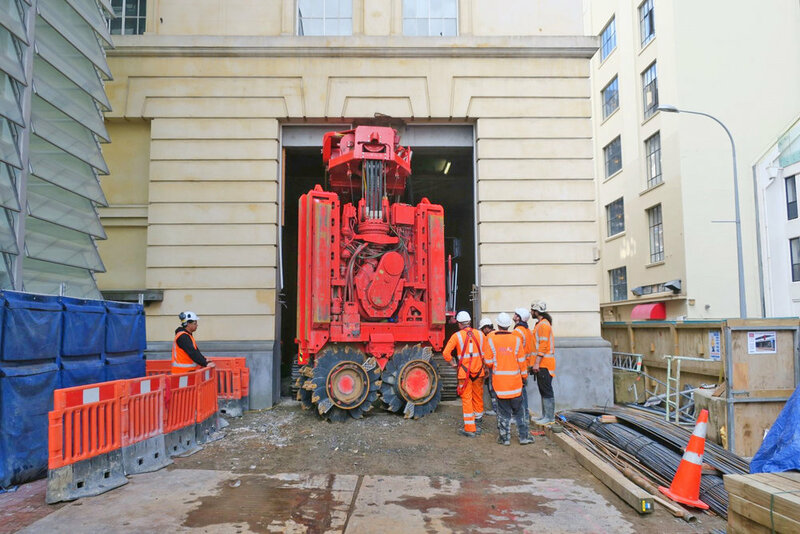 Sandrine (the nickname of a bright red 90-tonne compact hydrofraise piling rig) has been moved from outside the CPO/Britomart building and will soon be moved inside the building to enable another major part of the CRL's construction. The machine is needed to dig the 15 to 20-metre-deep diaphragm wall (or D-wall) panels that will form the structural support for the CRL tunnels inside the building. 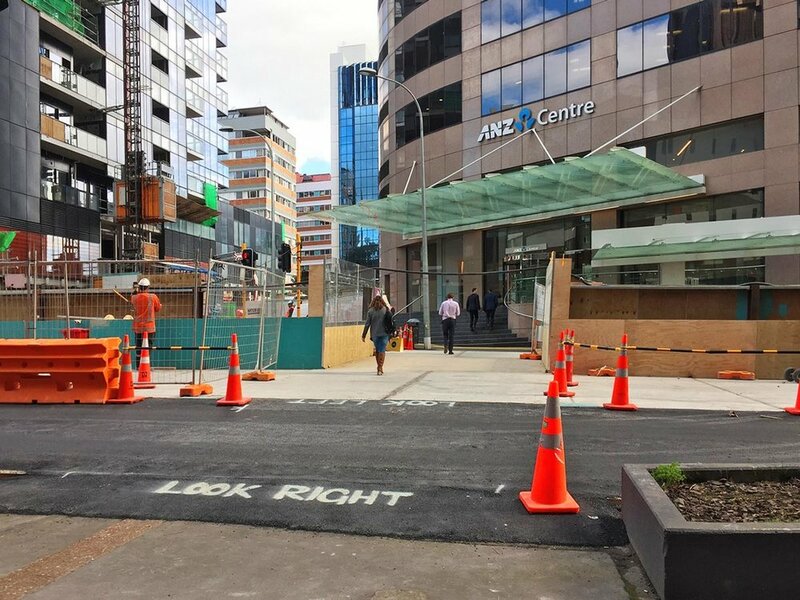 A second pedestrian crossing has been opened on Albert Street so you can watch the construction. This one is on Swanson Street, just outside the ANZ building (western side) and Grasshopper Thai Restaurant (eastern side). You can watch the preparation for the underground rail tunnels being done by the Connectus team (the McConnell Dowell and Downer joint venture). Please be extra careful when crossing it, as the southbound traffic line is live. In Albert Street, the Connectus team has been lowering a 23 tonnes bulldozer and a 10 tonne digger in the trench. The bulldozer and the digger will move soil to areas where the bigger excavator, located on the construction deck, can remove it. The team removed two steel deck panels and a steel beam to allow enough space to lower the machinery. Once the machinery was in the trench, the team then put the steel deck panels and steel beam back on. About 6,500 cubic metres of soil has now been extracted from the CRL’s Albert Street construction site – enough to fill almost three Olympic-sized swimming pools. This represents around eight percent of the total 77,000m3 of dirt that will be excavated before the Albert Street works are completed. Each of the small trucks on site is loaded with 5m3 of spoil and each of the big reticulated trucks waiting on the periphery of the worksite leave with 15m3 to take to a development site in Three Kings. Inside the number one shaft at Victoria St (downhill) shaft, the Connectus team has started backfilling over the new replacement stormwater pipe. This should be completed by the end of October. How much is needed? About 2,350m3 which is the equivalence of an Olympic swimming pool. They’re using recycled crushed concrete from a recycling centre in Penrose reducing the trucking which would be required is using quarries in south Auckland. Sandrine (the nickname of the bright red machine above) is a 90 tonne compact hydrofraise piling rig. 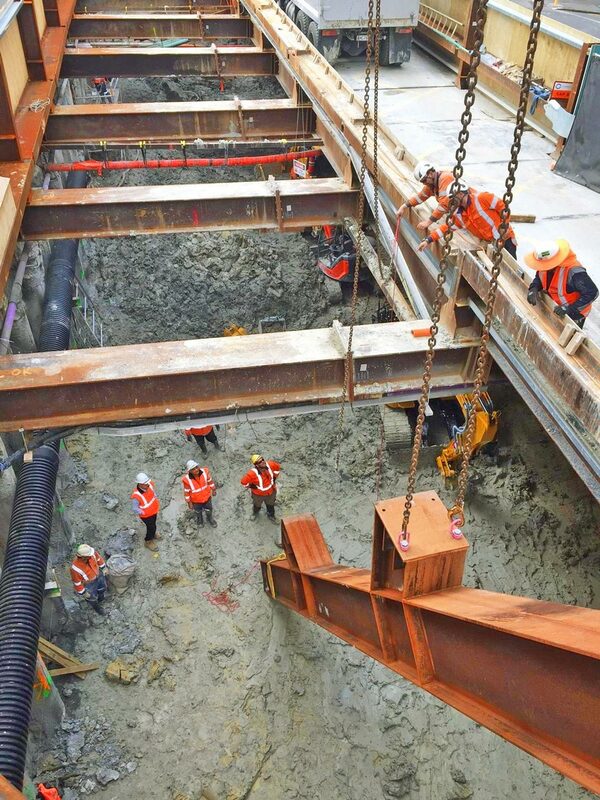 It's digging the 15 to 20-metre-deep diaphragm wall (or D-wall) panels that will form the structural support for the CRL tunnels at the CPO/Britomart building. A D-wall is a continuous wall constructed in the ground, typically to form an underground barrier or structure. The purpose of the diaphragm walls (D-walls) is to allow the rail tunnels to be constructed by supporting the existing foundations of the Chief Post Office (the underpinning structure will be supported from the D-walls), to provide ground retention during excavation for the rail tunnels and to prevent groundwater ingress into the excavations. They are constructed through a narrow excavated trench and supported by an engineered fluid (typically a sodium bentonite mud) which is later replaced by permanent concrete. Sandrine, this hydrofraise HC50 trench-cutter, is lowered through the reinforced concrete guide walls at surface level; as the name suggests the purpose of these walls is guide both the vertical and horizontal alignment of the trench cutter to ensure excavation commences in the correct position. As the trench-cutter moves downwards, its alignment is monitored in ‘real time’ on a computer screen at the HC50’s controls. At the completion of the works, the diaphragm walls become part of the permanent structure by supporting the CPO building and the CRL tunnel box. The work will take about six months. Sandrine is being used by construction partners Downer NZ and Soletanche Bachy JV as they work on the area around the building. Soletanche Bachy has a tradition of naming its machinery after women who work for the company. The rig is named after Sandrine Mussier, who has worked for CRL contractor Soletanche-Bachy for the past 20 years, looking after its international project staff. The bulk excavation continues between Wyndham and Swanson Street. We are moving the top 1.5 metres of the roadway and placing struts and concrete panels between Swanson Street and Wolfe Street. This will be completed at the end of September. Road level excavation will be fully completed in Albert Street in October 2017. The bulk excavation, taking place in Albert Street, is proving challenging work for CRL engineers. They must construct rail tunnels below groundwater level while maintaining surface-level access to Albert Street for foot and vehicle traffic. The excavation involves digging 18 metres at the deepest point, using long-reach excavators above ground and smaller machinery inside the reinforced trench. The tunnels will then be constructed with a cast concrete floor, walls and roof before the trench is backfilled. It represents about 10% of the 3.45km length of the twin-tunnel underground rail link. The work is being undertaken progressively from Wyndham Street at the southern end to Customs Street at the northern end. Excavation at the southern end is expected to be complete by October and the northern by the middle of next year. Construction of the tunnel box is expected to start late this year and be completed by late 2018. By spring 2019, this section of Albert Street will be reinstated with a new road surface, bus lanes, widened footpaths and street furniture. The bulk excavation marks a significant point in the construction process. You can watch progress at new viewing windows at the Wyndham Street pedestrian crossing. Located in the centre of the Albert Street, the north and south-facing windows allow an up-close look at progress on the cut and cover rail tunnel works. Viewing windows are being put in at a Swanson Street crossing. Connectus has finished the installation of 640m of capping beams on top of the 362 piles, connecting them together. The piles, forming the perimeter of the CRL tunnel box, were installed using a Soilmec SR100 Cased Continuous Flight Auger (CCFA) piling rig over the last six months. 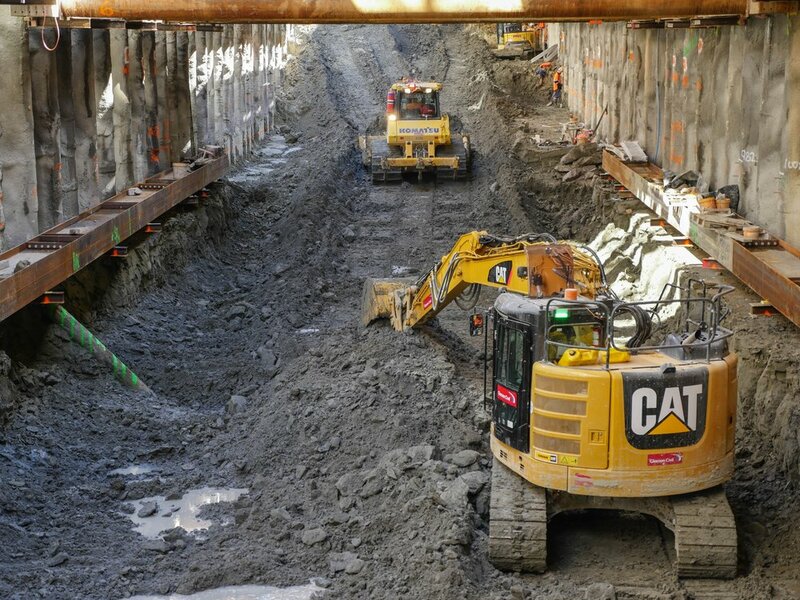 The team can now start the strutting and excavating work for the twin cut and cover tunnels along Albert Street from Customs to Wyndham Streets. Large steel struts are being installed, spanning between the capping beams to keep the entire structure rigid. All these steps reinforce the trench and support the traffic deck structure during the excavation process. At a BBQ celebration, Connectus engineer Craig Langsford says it’s a significant achievement. "The capping beam was very heavily reinforced and was completed within tight space and complicated traffic management constraints." 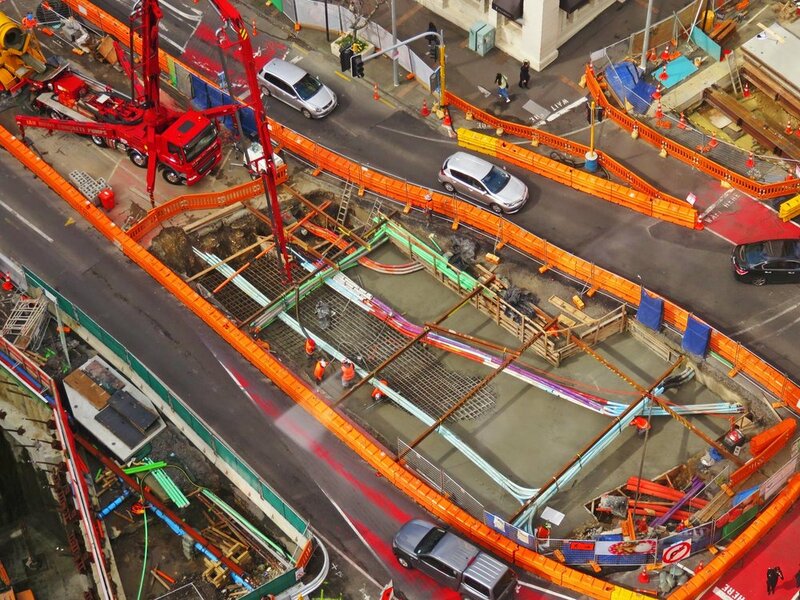 The first two concrete base slabs for the CRL twin-tunnels have been laid on Lower Queen Street. The 700mm-thick concrete slabs are the first eight metres of CRL tunnel box floor to be poured out of the total 3.45km length of tunnel to be constructed. 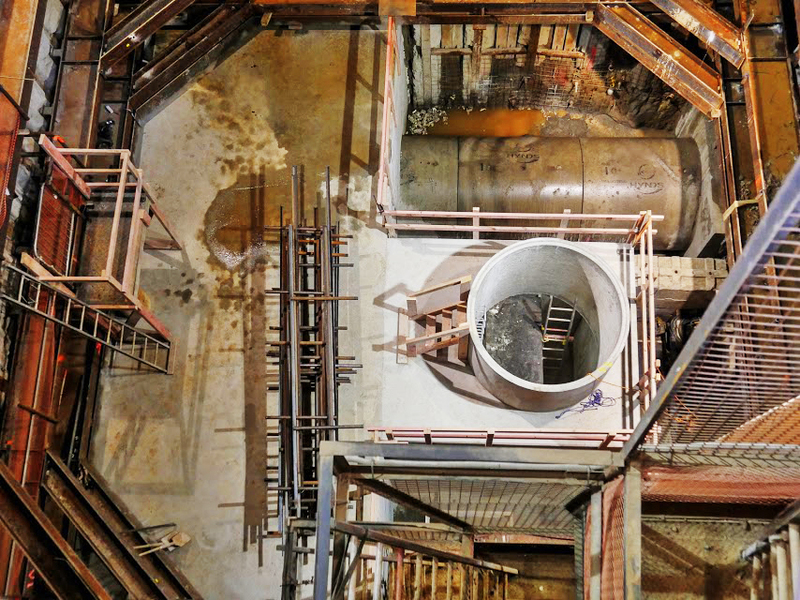 Located under the Lower Queen Street walkway, adjacent to the Zurich building, these tunnel stubs will eventually connect to sections of tunnel from Britomart Station and Albert Street. The slabs are protected by a high-tech water-proofing system to keep saltwater out, as they’re sitting about 13 metres below sea level. In about a week, construction will start on the walls for this short section of tunnel. When a roof is eventually placed over the top in few month’s time, the result will be the first completed section of tunnel box for the project. CRL Project Director Chris Meale discusses the current construction happening downtown. Bulk excavation work has started for the cut and cover rail tunnels under Albert Street. The excavation involves digging 18 metres (about five storeys) at the deepest (southern) point, using long-reach excavators above ground and smaller machinery inside the reinforced trench. The work will be undertaken progressively from Wyndham St at the southern end to Customs Street at the northern end. Those impressive-looking giant red silos outside the Britomart Transport centre have doubled in number - from three to six. The three complete the set-up of the plant, which will remain on site until early 2018. They will fulfil an important task in preparing the building for CRL tunnel excavation. How is this for a puzzle for those preparing for the tunnel construction! 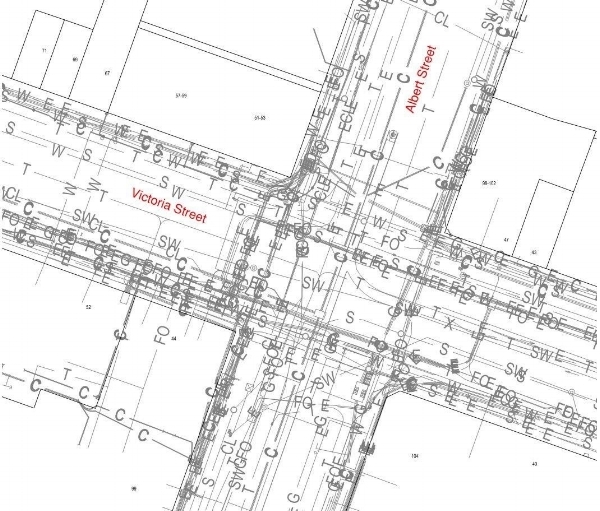 This is a map they've made of the utilities (like power lines) under the intersection of Victoria and Albert Streets. 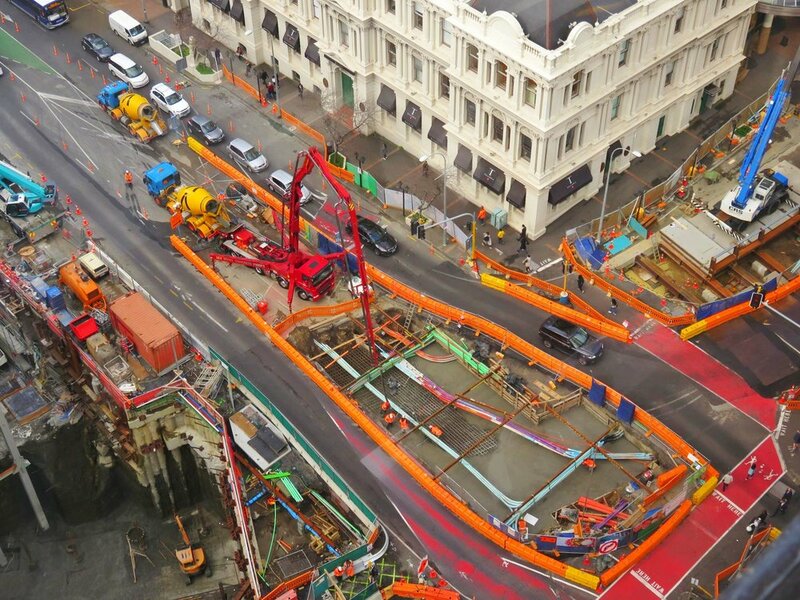 Here's a birds eye view of the construction outside the Britomart Transport centre (old CPO building) today. Scroll down further to see more commentary on what is happening. The silos are part of a specialised bentonite plant, shipped over from France by CRL contractor Downer Soletanche-Bachy Joint Venture, to help with the construction of diaphragm walls that will support the CPO building foundations and the CRL tunnel box. Sodium Bentonite is an absorbent clay that expands when wet. In civil engineering applications bentonite is used as a mineral hydraulic barrier in diaphragm walls, foundations, tunnelling, horizontal directional drilling and pipe jacking. The 3.5m-deep utility services trench constructed on Galway Street is almost complete. The trench was constructed to allow re-routing of existing underground services that would otherwise clash with CRL tunnel extension work at Britomart Station. Pre-cast concrete panels have been placed over the top of the trench and a structural topping will shortly be applied to form a concrete slab lid for the trench. Next week the temporary structures that were used to stabilise the soil either side of the trench during its construction, will be removed. A new water treatment plant will be installed in Galway Street on 10 July. On Albert Street, between Wyndham and Swanson Streets, the top 1.5m of road surface continues to be removed to allow the installation of an extensive steel support structure ahead of the bulk excavation works for the City Rail Link (CRL) tunnels. This structure will hold piled retaining walls apart during the CRL tunnel excavation along Albert Street and will also support a pre-cast concrete deck that enables the entire excavation to be completed while maintaining a lane of traffic in each direction. In the coming months, the operation will progress towards Customs Street and is expected to be completed in October. During this time, Connectus will also start excavating down to the level of the depth of the future CRL tunnels, progressively moving north from the Wyndham Street end. From 26 June, for about one year, southbound traffic will be diverted off Albert Street to the Wyndham to Victoria Street slip lane by the bluestone heritage wall. This provides the contractor a laydown and stockpiling area opposite the court house to facilitate the excavation and backfill operations associated with the tunnel construction. 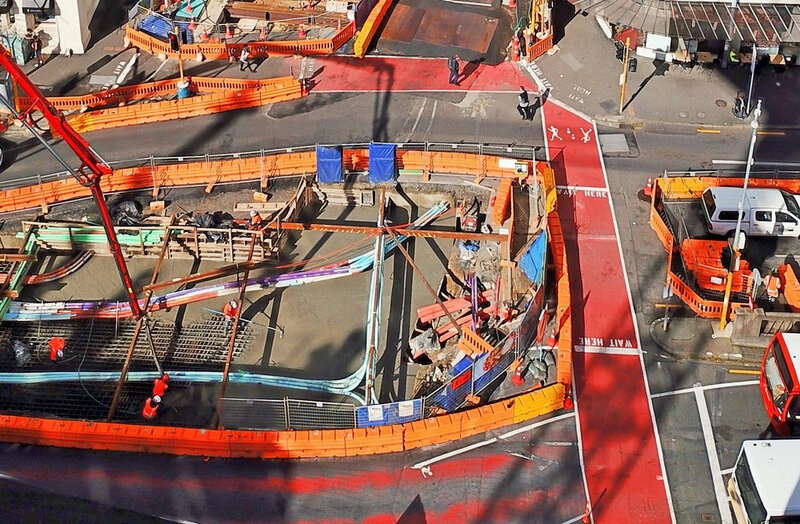 Scheduled from 5 July, northbound traffic along Albert Street will be temporarily diverted for three months via Swanson Street West and Federal Street to allow contractors more space to excavate the top 1.5m of roadway and install the large steel struts and pre-cast concrete traffic decks. Wolfe Street will be accessible from Federal Street but there will be no access from the Albert Street end. At the Albert/Customs intersection, construction is underway on the third of four sections of the traffic deck, which will form part of a bridge structure that spans the entire intersection, allowing all four traffic lanes to be re-established (likely by the end of September) while the CRL tunnels are constructed underneath. Now that the replacement stormwater pipe has been installed, the shafts that received the tunnel boring machines are being sealed and backfilled. This will allow the hoardings and construction sites to be removed. The Swanson Street shaft has been completed and reinstated. 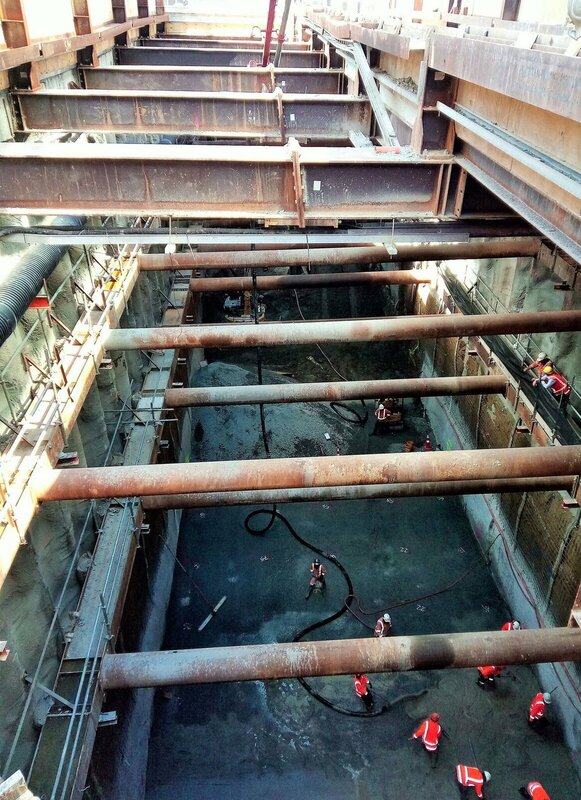 The Wellesley Street shaft is expected to be completed and reinstated in August. The two shafts at Victoria Street will remain in place until October while strengthening of the Orakei Main Sewer is undertaken. This work is required before the start of construction on the future mid-town station. Construction work won't start in Karangahape Road before 2019 - but preparation has begun. We never know what we will find under the streets once we do start digging. That's why we have to do some potholing and work out what utility lines are there. We survey each cable, pipe, and duct and then we can take that electronic information and start to model what that locality looks like. Then we can start to overlay other information like new structures such as the new Station walls, and see how these are currently interacting with the modelled utilities. If the utilities are in the way, then we can start assessing how and where we can relocate those affected utilities to. If the utilities are in the way, then we can start assessing how and where we can relocate those affected utilities to. With the new stormwater pipe built to replace the pipe running up Albert Street, here's what it looks like in the shaft on the corner of Victoria & Albert Streets. A new reinforced concrete chamber is being built to connect the existing Victoria St stormwater line with the new pipe-jacked line you can see at the bottom right of the photo. It’s hard to miss the large red silos that have gone up in Lower Queen Street but they’re there to fulfill an important task in preparing Britomart Station’s Chief Post Office (CPO) building for CRL tunnel excavation. Sodium Bentonite is an absorbent clay that expands when wet. In civil engineering applications bentonite is used as a mineral hydraulic barrier in diaphragm walls, foundations, tunnelling, horizontal directional drilling and pipe jacking. The silos are part of a specialised bentonite plant, shipped over from France by CRL contractor Downer Soletanche-Bachy Joint Venture, to help with the construction of diaphragm walls that will support the CPO building foundations and the CRL tunnel box. This week, three more silos will arrive to complete the set-up of the plant, which will remain on site until early 2018. Sodium bentonite is an absorbent clay that expands when wet. At the CPO building, bentonite slurry (a mix of bentonite powder and water) will be pumped into the trenches being excavated for the diaphragm walls to ensure the sides don’t cave in and ground water levels remain constant. The slurry keeps surrounding earth stable until steel reinforced concrete can be added in its place. Once concrete starts to be added from the bottom of the newly-created diaphragm wall, the bentonite is progressively displaced and sucked out of the diaphragm wall by a specialised hydraulic pump and transferred back to the silos. The slurry can then be re-used again and again as required. When working around sensitive heritage buildings, this method has less impact than traditional piling techniques as it minimises noise, vibration and impact on natural ground water levels. This is the service trench which is being constructed on the Galway Street side of the station. This will house various services which connect to the new station. This video from Downer NZ and Soletanche Bachy (DSBJV) shows the work they're doing at Britomart Transport Centre (the former CPO). At the southern end of Albert Street works, the top 1.5 metres of roadway is being removed. This allows for installation of an extensive steel structure to support both the pile walls and a pre-cast concrete deck so the excavation can be completed while maintaining a lane of traffic in each direction. In the coming months, this operation will progress towards Customs Street and is expected to be complete in October. 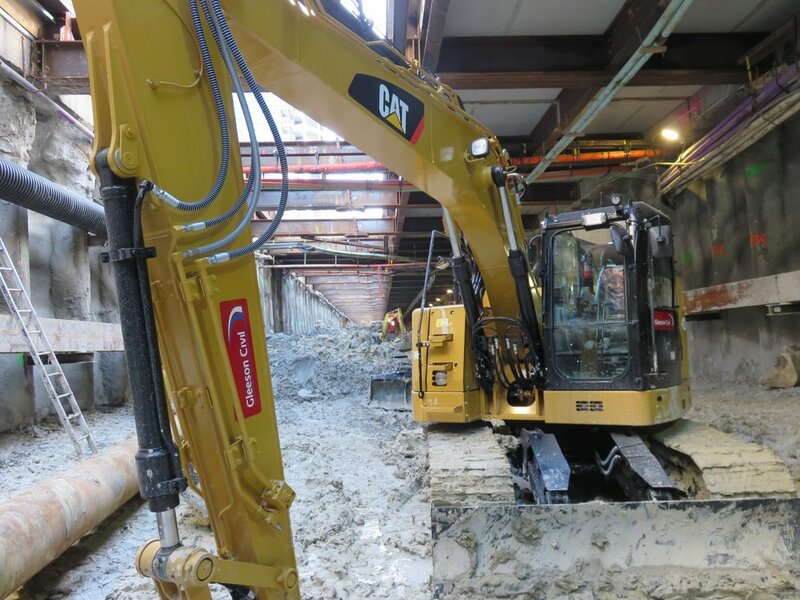 During this time, our contractors Connectus, will also start excavating down to the level of the CRL, progressively moving north from the Wyndham Street end. At the Albert/Customs Street intersection, construction is underway on the third portion of the traffic deck, which will form part of a bridge structure that spans the entire intersection, allowing all four traffic lanes to be re-established while the CRL tunnels are constructed underneath. Now that the stormwater replacement has been completed, the shafts that received the tunnel boring machines will be sealed and back-filled. This will allow the hoardings and construction sites to be removed from Swanson and Wellesley Streets. The two shafts in Victoria Street will remain in place until September while strengthening of the Orakei Main Sewer is undertaken. This work is required before the start of construction on the future mid-town station. At Britomart, work continues on preparing the interior of the Chief Post Office (CPO) for tunnel excavation. The floor is being removed, piling works have started, the glass bridge that used to run between the CPO and Commerce Street is being removed, and diaphragm walls are being prepared ahead of tunnel excavation. In addition, a huge utilities trench has been dug in Galway Street. With Lower Queen Street now closed to pedestrians, more substantial construction equipment will be installed and piling in the area will begin in October. Interesting historical artefacts - such as these five vessels found behind the Chief Post Office building - continue to be found during CRL excavation works. Read more about it in our Hidden Treasures Found feature. Lower Queen Street now has a new walkway linking Customs and Quay Streets. Its distinctive wave pattern reflects its harbourside location and lights up at night. The walkway is a joint effort between CRL, Precinct Properties and Activate Auckland. It's intended to provide a safe, well-lit and attractive route that separates pedestrians from CRL construction on the eastern side and the Commercial Bay property development on the western side. Vehicles have their own lane through Lower Queen Street to access Tyler and Galway Streets, either side of Britomart Station. This walkway is expected to stay in its current location until August, when it will move further west and vehicles switch to the east to better manage truck movements for changing construction needs.